EDA also undertook initiatives to help communities learn lessons from past disasters, gain access to a greater number of existing resources, and bolster impact assessment efforts. Additional EDA recovery efforts included convening “train-the-trainer” workshops on access to capital, organizing a tourism recovery peer-to-peer forum, and supporting collaborative efforts among federal and state governments and the private sector to build and reinforce disaster resilience capacity in local businesses and communities. Census Bureau statistics also assisted the public and first responders in their recovery efforts. Census’ OnTheMap for Emergency Management tool provided federal, state and local officials and emergency planners with information about communities affected by the storm. It furnished information not just on the number of people affected by Hurricane Sandy, but also on some of their characteristics – for example, over 9 million affected residents were 65 or older. Among other applications, New Jersey planners used this data to estimate the volume of traffic in storm-damaged areas. In addition to supporting the physical recovery, Census Bureau data also provided important key information for the economic recovery from Hurricane Sandy. Census employees compiled detailed work area profiles, worker inflows and outflows, and economic census data to assist workers, employers, and government agencies in New York and New Jersey. The agency also monitored the storm’s effects on manufacturing and supply chains, both domestically and internationally, in the wake of widespread power outages and infrastructure problems. 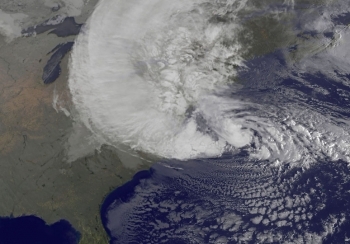 Sandy disrupted communications for millions of people and thousands of businesses along the East Coast, which created both short term safety and long term rebuilding challenges. That is why in its August 2013 report (see page 69), the White House’s Hurricane Sandy Rebuilding Task Force called on NTIA and the U.S. Department of Energy to work with the Federal Communications Commission to develop recommendations that will help facilitate improved resiliency for cell phone towers, data centers and other critical communications infrastructure in the event of a power disruption following a disaster. The task force will release a report with those recommendations soon. By providing timely and accurate forecasts and collaborating closely with its partners, NOAA’s National Weather Service (NWS) helped save lives by providing critical information that prompted people to act. In the years since Sandy struck, NWS has also taken steps to improve its products and services. For example, newly-upgraded supercomputers are now more than twice as fast as they were during Sandy. These supercomputers conduct 213 trillion calculations per second and process sophisticated computer models to provide more accurate forecasts further out in time. These upgrades will enable more accurate and consistent forecasts in advance of extreme weather events. More accurate weather prediction models help NOAA forecasters provide better information to decision makers so they can determine whether or not to issue evacuation orders, pre-position rescue crews, or order bottled water and extra generators, for example. In addition, NOAA’s National Hurricane Center released a new mapping tool earlier this year that will be used to show communities their storm surge flood threat. The map will be issued for coastal areas when a hurricane or tropical storm watch is first issued, or approximately 48 hours before the anticipated onset of tropical storm force winds. The map will show land areas where storm surge could occur and how high above ground the water could reach in those areas. NOAA, working with partners at FEMA and the U.S. Army Corps of Engineers, also created a set of web-based map and data services to help communities and businesses take into account future risks from sea level rise in planning for reconstruction efforts. The sea level rise viewer tool offers access to data and information about the risks of sea level rise, storm surge, and flooding along U.S. coastlines. The site was designed to support building resilient communities by providing decision makers with access to information they need when assessing future risks posed by sea level rise. All of these investments are critical to helping NOAA pave the way to a Weather-Ready Nation. A key lesson of Sandy and other recent disasters is that we can no longer treat key components of our built environment such as buildings, roads, and energy networks as wholly separate entities when it comes to standards, codes and regulations. The performance of buildings and systems affect one another during a disaster and affect how well a community recovers in both the short and long term. The 2013 President's Climate Action Plan therefore called on NIST to develop a Disaster Resilience Framework of voluntary standards, best practices and guidelines to bolster the ability of communities to be more resilient in the face of increasingly frequent and more costly disasters. NIST has been hosting a series of workshops across the country to engage a broad network of stakeholders in developing the framework, a draft version of which will be released in the spring of 2015. The second of those workshops was held in Hoboken, N.J., and kicked off with a session on resilience lessons from Sandy. Earlier this month, NIST named nine Disaster Resilience Fellows to support the framework effort and to establish a Disaster Resilience Standards Panel. NIST is also launching a Community Resilience Center of Excellence that will develop tools to support community disaster resilience. The goal of all these efforts is to help communities prevent disruptive hazards from becoming disasters, and to recover more quickly and fully regardless of the type or intensity of disaster. Sandy started a new conversation around the country; a conversation around how readily communities can bounce back from extreme events and how they can prepare for future disasters and long-term change. These efforts and more are just some of the ways the federal government and Department of Commerce are helping build more resilient communities.